Identification: Each hindwing has 1 long and 1 short tail. Upperside brown with orange spot on hindwing near tails. Outer edge of forewing usually has row of orange spots. Underside brown-gray with orange submarginal crescents and a postmedian band of black spots. Life history: Males search for females by perching on top of trees (occasionally patrolling). Females lay eggs, glued together in groups of 2-4, in bark crevices. Eggs hibernate until the following spring. Caterpillars eat leaves. Caterpillar hosts: Amelanchier alnifolia, Prunus virginiana; Cercocarpus, Ceanothus, Quercus, and Salix species. Adult food: Nectar from flowers of wild buckwheat, milkweed, sulphur flower, and others. 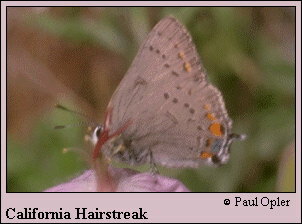 Habitat: Chaparral, brushland, forest edges, open woodland. Range: British Columbia south to southern California and east to Colorado. Conservation: Valley oak-associated population in California's central valley is threatened by loss of habitat. Management needs: Conserve remaining stands of Valley oak in California Central Valley. Brown, J. W., H. G. Real, and D. K. Faulkner. Butterflies of Baja California.